There's plenty to see and do at the GIANTS' clash with Fremantle at UNSW Canberra Oval. A GIANTS ACT membership is one of the best value in any sport, CLICK HERE to see our range of packages and sign up today, or head to the Membership Hub outside the West Gate at UNSW Canberra Oval. 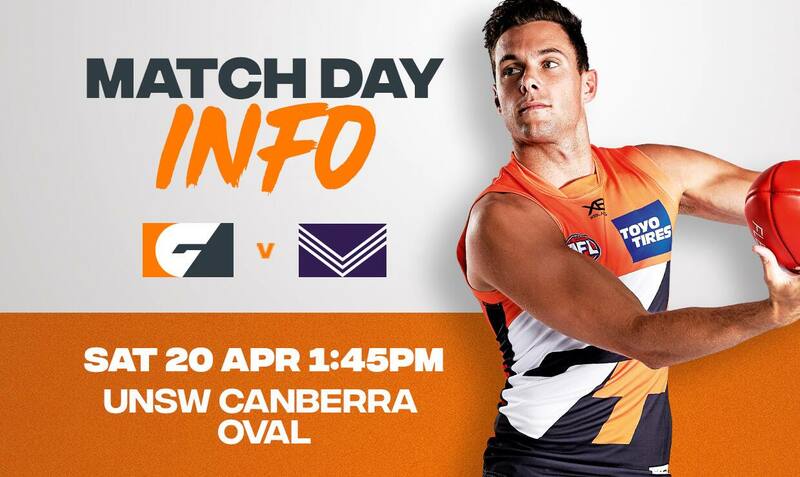 Be there for the GIANTS’ first AFL game in Canberra for 2019 as they take on the Fremantle Dockers in Round 5. You can also call 13 28 49 or visit Ticketek agencies. The ticket office at UNSW Canberra Oval will be open from 12:35pm, located at the West gate. Canberra GIANTS fans, start your Easter Long Weekend in a GIANT way this Friday with our open training session! Ahead of our round five clash with the Fremantle Dockers at UNSW Canberra Oval, the GIANTS will go through their paces at the venue in a light run from roughly 2pm on Friday. For more information CLICK HERE. The specific times for each service can be found by CLICKING HERE. Car: Public car parking is available at a number of locations around UNSW Canberra Oval, including Kingston Shopping Centre; Manuka Shopping Centre, Kingston Oval and surrounding streets. Patrons are reminded not to leave valuables in their cars as they are responsible for the security of their own vehicles. Disabled Parking is directly outside the Main Gate of UNSW Canberra Oval with limited spaces available. Vehicles must display permits to gain access. Major Event Parking: General Parking is available at Kingston and Manuka Shopping Centres, Kingston Oval and surrounding streets. Please refer to the seating plan to see which entrance would be most convenient to gain access to your seats. You can pick up some gear from the merchandise hut inside the West gate or from the merchandise van inside the East gate. Members receive 10% off all merchandise! Visit the membership marquee by the main gate to sign up and take advantage of this members’ exclusive discount. Everything's bigger up close with a GIANTS Membership. To join, click here. - UNSW Canberra: Get to the UNSW Canberra Fan Zone on the east wing early to secure your spot on a bean bag to watch the game! Challenge your friends to GIANT Jenga and GIANT Connect Four pre-game and during breaks! - Canberra FM will be bringing music and fun to the fan zone. - Kia’s Beat the Sting: Come and visit the Kia Fan Zone where you can get game ready! Write you message of support on the cheer cards, grab a photo in the Stinger or your face painted in GIANTS colours. Also learn how you can enter our quarter time on field race to beat The Sting, for your chance to win a Stinger! Get excited GIANTS fans, because in season 2019 we have a new quarter time competition – Kia’s Beat the Sting. The premise is simple – one lucky contestant is going to run 200m from point post to point post along the boundary for the chance to win a brand-new Kia Stinger. The catch? They have to beat The Sting. Watch the next generation of GIANTS in action on UNSW Canberra Oval during the NAB Auskick matches at half-time. UNSW Canberra, a proud sponsor of the GIANTS, is offering one lucky fan the chance to win $1000. Simply listen out for a song, put your sunglasses on, smile for the camera and show us your best dance moves. The person with the biggest smile and the best dance moves will win $1000 thanks to UNSW Canberra! The Toyo Tires Kick for Cash is back and bigger than ever! $100,000 is up for grabs at every GIANTS home game this season. But this year, if the participant is a 2019 GIANTS Member, they’ll be kicking for an incredible $150,000! Simply post a selfie prior to the first bounce this Saturday on Facebook, Twitter or Instagram using #DrivenToPerform and you could be kicking for $100,000 or $150,000 at three-quarter-time. Kick 2 Kick is back! Thanks to McDonald’s, head on-field after the second siren and have a kick with your mates on UNSW Canberra Oval. Kick 2 Kick will be on at every GIANTS home game at GIANTS Stadium and UNSW Canberra Oval, thanks to McDonald’s, the official restaurant and official coffee partner of the GIANTS and AFL. The GIANTS team will be named on gwsgiants.com.au and the Official GIANTS App at 6.20pm on Thursday evening, with the final team to be named 90 minutes before the match. The round five match will be shown live and free on 7mate in NSW and the ACT from 1:30pm on Saturday afternoon. The match will also be shown on Fox Footy, via the AFL Live app and on Kayo with a subscription purchase. For the latest television and radio broadcast guide, CLICK HERE. You can also follow the GIANTS on social media for game updates and behind-the-scenes content on Twitter, Facebook and Instagram @GWSGIANTS.